Gregg’s Gift Annual Comedy Night is hosted in partnership with Caron New York! 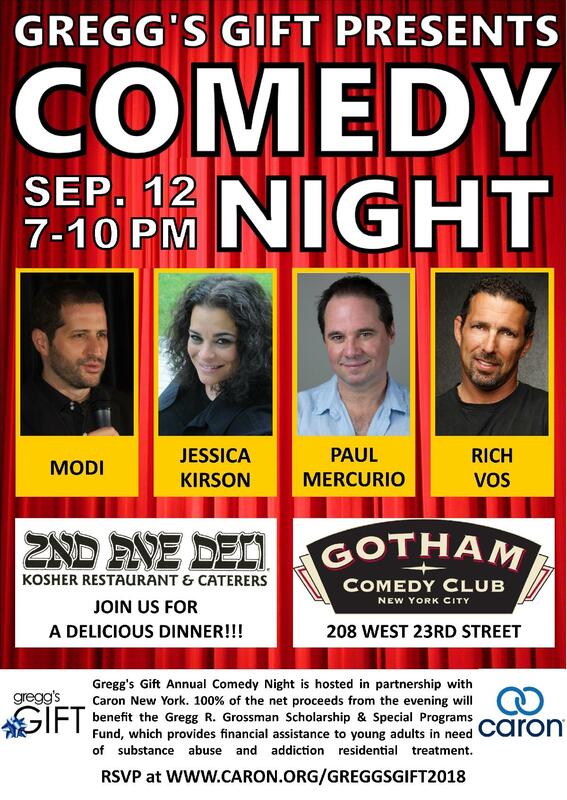 Join us for a sober night of laughs, delicious food, and hilarious stand-up comedy performances! The mission of Gregg’s Gift is to positively impact the lives of addicted young adults, their families, friends, and our community at-large. Their mission is to raise money to provide financial assistance for the treatment and recovery of young adults who suffer from the disease of addiction and to heighten community awareness of the severity and complexity of addiction. Through the establishment and growth of the Gregg R. Grossman Scholarship & Special Programs Fund, Caron Treatment Centers will provide hope, healing, and recovery to young adults who suffer from addiction. Gregg's legacy will help the young adult alcoholic/addict who still suffers by removing financial barriers of those who turn to Caron for help. All proceeds will go directly to the Gregg R. Grossman Scholarship & Special Programs Fund, which provides financial assistance to young adults in need of substance abuse and addiction residential treatment.